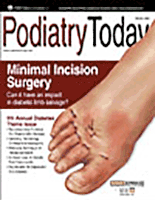 Nerve surgery, especially tarsal tunnel surgery, has been very difficult to perform. More often than not, it is a poorly used treatment in foot and ankle care. Often, the diagnosis is difficult to make and surgical treatment may not result in the best outcomes if physicians have not emphasized careful patient selection. To date, the most common workup for tarsal tunnel and other peripheral nerve problems has been a nerve conduction test (NCV) with or without an electromyelogram (EMG). Both of these tests have shown moderately good potential in the upper extremity but have been very poor in the diagnosis of lower extremity nerve problems. In a personal conversation with A. Lee Dellon, MD, one of the experts in peripheral nerve work, I have noted that in most cases of positive EMG and NCV tests, the nerve is nearly burned out and has little to no chance of improvement with surgery. Basically, EMG and NCV tests have a very high rate of false negatives and, in the rare case of a positive reading, the nerve may be too far gone for an adequate outcome. The newest form of testing to gain popularity in foot and ankle peripheral nerve surgery is neurosensory testing. The form of one- and two-point discrimination with the Pressure Specified Sensory Device (PSSD) allows very early diagnosis of peripheral nerve alterations and has been an excellent source of information in the early care of peripheral nerve problems. Although the PSSD test is a dramatic improvement over EMG and NCV testing, it is patient driven and does take a careful technologist to detect when a patient is pressing the button without actually feeling the proper sensation. With the improvement in all types of foot and ankle care, nerve surgery is still a very difficult area when it comes to proper imaging and diagnostic testing is still limited. Accordingly, the diagnosis is often a process of elimination or a clinical diagnosis. Physicians often confuse tarsal tunnel syndrome symptoms with plantar fascia pain, posterior tibial pain and even possible tendonitis of the arch. However, in chronic cases, certain findings that emerge from a proper history and physical exam are very helpful. Patients will often complain of pain in shoes or with exercise. Patients may also note discomfort with orthotics or arch supports as the devices may press on the nerve in the area of the raised arch. They often note tingling and radiating pain. In regard to the common peroneal nerve at the fibular head, patients often note a weakness of dorsiflexion and/or eversion. Patients will also note tingling of the dorsum of the foot and leg with or without lateral leg and foot pain. One of the best clinical guides to nerve entrapment is a positive Tinel of the associated nerve. If one follows a patient for a period of time and he or she continues to have a tingling of the nerve with pain along the course of the nerve with tapping of the nerve in the area of potential entrapment, a neuritis or nerve compression is often present. In such cases, our workup proceeds to diagnostic imaging of the site for a potential mass or lesion. One may utilize either diagnostic ultrasound or magnetic resonance imaging (MRI). Furthermore, physicians may order bloodwork to screen for potential arthritic conditions, vitamin deficiency, lead poisoning and medication toxicity. Finally, one should review the patient’s medication history and check for potential systemic causes of nerve irritation. Subsequent to all of this testing, many patients still have no underlying cause for their nerve pain other than mechanical entrapment or neuropathic entrapment. In such cases, one may use a PSSD test to diagnose the level of nerve damage and its location. Often, a case of suspected unilateral tarsal tunnel also seems to affect the other tested nerves. This suggests a potential neuropathic problem, which may require further systemic workup. If one notes a local nerve problem, the physician may order EMG and NCV tests as a secondary check not as much for the extremity issue but more for lower back problems. If you suspect a lower back issue, you must refer the patient for pain management assessment or a spine workup prior to surgery. With all of this testing, it is still often frustrating to diagnose peripheral nerve entrapment syndromes and the diagnosis is still mainly a clinical one. With the advent of intraoperative nerve testing machines, physicians can locate and check the nerve for entrapment through a small intraoperative incision. For example, in the case of a suspected tarsal tunnel syndrome case, one can make a 1- to 2-cm incision over the tibial nerve within the retinaculum. Use small needle probes to enter the adductor and abductor muscle bellies for EMG testing and perform a nerve conduction of the tibial nerve through direct visualization and contact with the nerve itself. I prefer to use the Medtronic peripheral nerve system and have found it very easy to set up and use. The company has calculated ideal levels and one can use intraoperative testing to check the nerve against these ideal levels. If you note a nerve entrapment, it is now documented and the surgery proceeds with a decompression. Physicians can use this form of testing for any nerve but it is truly excellent for tarsal tunnel and common peroneal nerve compression cases. Intraoperative nerve testing also allows identification of the bifurcating nerve branches and specific testing of each of these branches at their dividing point. For example, by testing the medial and lateral plantar nerve separately in tarsal tunnel surgery, one can diagnose which nerve or nerves are compressed, and pay greater attention to each nerve. The surgeon frees the retinaculum over each nerve until there are adequate conduction levels noted with documentation of each tested nerve. If there is still compression after a complete release, one may perform an internal neurolysis of the nerve under high power magnification. Our findings with intraoperative nerve testing have been amazing to say the least. While rare, there have been a few cases in which intraoperative testing shows ideal levels and a nerve release has not been done, thus negating the chance for potential complications. In almost all cases, though, we have found that one nerve is more compressed than the other at the division point of the tibial nerve. However, both nerves are often far below the normal levels of nerve testing. As the decompression proceeds and we perform subsequent nerve testing, we see improvement in conduction and this acts as an excellent guide for over or under decompression. Once one has achieved adequate levels, an excellent printout of start and finish levels is documented. This allows the surgeon to better note the level of compression pre- and post-surgery. The testing with the machine from Medtronic is very easy to perform and is painless for patients. In a few cases, the nerve conduction levels do not seem to improve during decompression. It is essential to check placement of the leads in the adductor and abductor muscle bellies. If the leads are poorly placed, backing out or too deep, the reading may be low and one should recheck these after lead placement alteration. Furthermore, physicians should bear in mind that the levels to be attained are suggested and not exact. When it comes to neuropathy and chronic compression cases, these standardized levels may not be attainable. Therefore, an improvement from the start to finish of test levels may be all the improvement possible. Although nerve surgery is complicated and frustrating due to the lack of imaging and the underlying difficulties with diagnostic testing, the addition of intraoperative nerve testing has improved outcomes and decreased associated complications in our hands. We find the testing painless, simple and very helpful in the documentation of the entrapment or lack thereof. We also find the testing essential in guiding the physician for an improved intraoperative nerve release. With proper patient selection and improved testing, nerve surgery has the potential to make dramatic advances and is far less complicated. There is reduced guesswork and improved intraoperative confidence in the release.